This was the scheduled NEC meeting for July (below I cover the Emergency NEC meeting of 12 July). The atmosphere at this meeting was much better than at last week’s Emergency NEC meeting. In part this was due to the fact that Jeremy was present for the whole NEC and contributed throughout the meeting. This, of course, was the practice of all leaders until the advent of New Labour. Not only did Tony Blair downgrade the role of the NEC but also he was never prepared to spend more than an hour at our meetings. Jeremy is restoring the custom that served the Party well for over ninety years. Jeremy clearly appreciates the major and governing role of the NEC. One very notable feature of this NEC meeting was that, as has been the case in the past, some NEC members participated in the NEC via phone (in one case from Brittany), but on this occasion the Chair allowed voting by phone. To my mind this is a helpful development because sometimes NEC members are unavoidably absent. The first part of the NEC was taken up with paying respects to the comrades we have lost, especially Jo Cox. It was agreed that the General Secretary would consult with Jo’s family in order to agree on a permanent memorial so that Jo would never be forgotten. I suggested that Tom Watson’s proposal that bursaries for working class potential candidates for office could be named in her memory. At the start of the meeting proper several NEC members wanted to raise the decisions in relation to leadership election procedure that were rushed through at the end of the Emergency NEC. It was pointed out by trade union reps that the newly appointed Procedures Committee had made further controversial decisions in relation to union participation. In response, the Chair pointed to the NEC Standing Orders which contain a 3 month rule. The Chair also confirmed Procedures Committee has delegated powers and that, in effect, its decisions are final. Jon Trickett reported that the Shadow Cabinet continued to believe that a process of mediation should take place with a view to restoring unity in our Party. I pointed out that at the Emergency NEC we had agreed to mediation in principle and therefore this was a very good idea. The General Secretary undertook to explore this further. Jeremy confirmed that discussions are underway to have a permanent memorial for Jo Cox in the House of Commons Chamber. He was also pressing for an award to be given to Bernard Kenny for his brave actions trying to defend Jo. Jeremy also reported that he is pressing the Commons authorities for much more sensitive and flexible arrangements regarding the employment of MPs staff in such circumstances. Jeremy also reported the sad news that we have just lost David Hopper, a stalwart of the NUM and for many years the Party’s Auditor. Together with David, Jeremy had attended the largest ever Durham Miners’ Gala. Jeremy added that the Tolpuddle Martyrs festival was especially successful this year. Jeremy then stressed (as he has done on many occasions) the importance of taking a strong line against any abuse within our Party, especially involving social media. Jeremy had invited Shami Chakrabarti to the NEC and the NEC was given an opportunity to discuss Shami’s report (see below). Jeremy confirmed that he was seeking to have a 50% gender balance in the Shadow Cabinet and indeed in the whole Shadow team. Jeremy had also convened a ‘Women in Engineering’ reception. Among other events Jeremy had attended was the Pride parade in London and a vigil expressing solidarity with Orlando. Jeremy also represented the Party at the special ceremony at the Somme. Jeremy then addressed the issue of the EU referendum. Despite the hostile press and media coverage, Jeremy emphasised that he did treat the referendum very seriously and had attended numerous meetings. Despite what the detractors put about, Jeremy did not have a week’s holiday. Rather, on Easter Monday, he went to Exmouth for one night, and then early next morning he and Laura travelled to Port Talbot to show solidarity with the steelworkers. In other words, the holiday was 19 hours at most. Jeremy confirmed that the Shadow Cabinet and the Party were developing an effective strategy for responding to the implications of the EU referendum result. Jeremy is also studying the arrangements that Norway has with the EU and has invited a delegation from Norway to give us more details and to answer intricate questions. Jeremy stressed in relation to the complaints of low wages, it was certainly not the migrant workers that were to blame, it was the employers that employed migrant workers that are to blame. The next Labour government will rectify this situation and remove the blight of low pay. Jeremy stressed that we need to be in the EU to protect rights and to improve them. He said he was misreported and did not ask for the immediate triggering of Article 50. Jeremy also pointed out that he had disagreed with those Labour MPs who shared platforms with UKIP. Later in response to Jeremy’s report, I stressed that the EU referendum had been the most appalling campaign that I could remember. Both sides disseminated false information. By far the worst aspect of the whole saga was the terrible negative message it sent out to minority communities. In Oxford, I spent many hours reassuring friends in shops from the Sikh, Pakistani, Bangladeshi, and Kurdish communities and reaffirming to them that they play a vital role in our society and that they are appreciated. Finally, Jeremy highlighted the need for a continent-wide campaign against racism and the resurgence of the far-right. Jeremy also took the NEC through the Party’s and his own response to Chilcot. This had been very revealing about the way the whole Iraq tragedy was handled by ministers and officials. There are a lot of lessons to be learned. 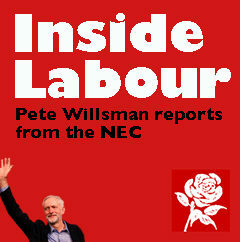 Jeremy introduced Shami to the NEC and warmly thanked her for producing such an excellent report in such a short time. The Inquiry had addressed the accusations of anti-Semitism, Islamophobia, other forms of racism, and also misogyny. Jeremy emphasised that our Party must always give the warmest welcome to members of all communities. Our Party now has over 500,000 members and three million affiliates. Membership is now at the highest level since the early post-war years. It shows that despite what the hostile press and media say many people are still very interested in being involved in politics. Shami then spoke to her report and responded to comments from the members of the NEC. In her report, Shami had recommended that the Party’s Code of Conduct should be amended so as to comprehensively rule-out all forms of prejudice. Shami also made a large number of further recommendations, which can be viewed online. I particularly congratulated Shami on the last two recommendations: that the Party should increase the ethnic diversity of its staff; also that no part of the Party should be subject to ‘special measures’ for more than 6 months without an NEC review of that decision. Further the NEC must provide a plan as to how the local Party is to improve its practice and return to full democratic rights. I pointed out that some Parties have been in ‘special measures’ for at least 20 years. I also queried Recommendation 10, which proposes that the power of interim suspension should be vest in the NCC and not the NEC. Having been on both committees, I am convinced that the NEC is the appropriate body. Jeremy added that he is also concerned at the long-term suspensions and welcomed Shami’s proposal. He confirmed that we need a harassment code in line with the codes that most trade unions enforce. Tom Watson had unfortunately had to leave, meaning that we were deprived of Tom’s words of wisdom. Jon Trickett, Iain McNicol, and key staff gave a detailed presentation. They outlined the preparation that is already well in-hand to cover any possible early general election. I asked a question about the Fixed Term Act, namely that if Theresa May wanted a general election two-thirds of the House of Commons would have to agree. This means that our Party has a veto. It was confirmed that this was the case. I responded that since this was the case, we need to judge the situation on its merits. The Tories may say that we are running away, but we may equally respond that we do not believe that the public’s time and money should be wasted so soon after the last general election. In other words, we should assess the situation and not simply do what the Tories want. In the event of an early general election, the NEC were concerned about how the manifesto would be prepared, particularly given that we have not had a National Policy Forum meeting for nearly two years. A large number of new members were elected to the NPF and they must be beginning to wonder whether the NPF even exists. Without any policy from the NPF, what would be the basis of a manifesto? This question was not satisfactorily answered. The General Secretary was very pleased to report that the massive increase in new members (together with their further generosity) has brought millions of pounds into our coffers. The General Secretary also took the NEC through a first draft of the programme for annual Conference. It was agreed that the Women’s Conference would make a report to the main Conference. It was also agreed that the Leader’s speech would be on the last afternoon of Conference. Jeremy will focus his attack on the Tories and thus the delegates and visitors will leave in a fighting mood, ready to defeat the Tories. Ann Black pressed for much more flexibility this year in relation to Contemporary Motions, given that the NPF has not yet even met! The General Secretary took this point on board and will advise the CAC accordingly. Iain also presented the Audited Accounts and a summary of this will be in the NEC Report. The General Secretary confirmed that the special conference to announce the result of the Leadership Election would also be linked to annual Conference. Final arrangements for this have not yet been agreed. This Emergency NEC was called solely to discuss the arrangements for the Leadership Election. A full report is provided on one of the Campaign for Labour Party Democracy’s websites, www.grassrootslabour.net; also information concerning the leadership election is provided on the main CLPD website, www.clpd.org.uk. At the Emergency NEC, I thought the legal argument put by the lawyer who argued that Jeremy must get 51 nominations was hardly worth the paper it was written on. On the other hand, it seemed to me that the legal case held by the majority of the NEC (18, of which I was one) was an open and shut legal case. Unfortunately at the end of a very long and exhausting meeting the majority of the NEC (of which I was not one) made a series of rushed decisions about the procedure of the Leadership Election. I made a statement to the effect that our Party was conducting an OMOV ballot of some 700,000 members and supporters, and this sends out an incredible positive message about our Party. I pointed out that some of these decisions will undermine this positive image and will reflect badly on the NEC. Many members of the NEC complained at the way discussions at the NEC were being immediately leaked to the hostile press and media. Indeed, I suffered from misrepresentation myself. It was alleged that I had argued for a split in the Party and for the expulsion of the Blairites. In fact what I said and what I think was to the contrary. I clearly stated at the Emergency NEC that I always believe in talk-talk, not war-war, and therefore I wanted as much mediation as possible, in order to find a way forward that would lead to unity. But I added (perhaps somewhat flippantly) that if the anti-Jeremy faction declared war, and that there was a split, at least we would see the back of the Blairites. It has to be said (and indeed it has been said by a review conducted at the LSE) that the hostility and vilification of Jeremy in both the tabloid and broadsheet press as well as in the media is unprecedented and is an affront to democracy (which the press hypocritically say they uphold). In particular, as I pointed out at the NEC, some of the worst offenders are the Guardian and Observer. It’s not that long ago that the right-wing columnist, Melanie Phillips, was a cherished member of the Observer staff. Nick Cohen seems to be following Mel’s footsteps. The partisan press and media will fall for any story providing it harms Jeremy. Every day we are told about these appalling abuses meted out to meek and mild MPs (the same MPs who are hurling abuse at Jeremy at PLP meetings). Over the next few weeks expect the hacks to accuse Jeremy of everything bad that has happened, perhaps even including England’s poor performance in the European Championships. In the biased world of the press and media, what the opponents of Jeremy tell them is always true, but in the real world the opposite is often the case. Good work Pete – some interesting stuff there eg about Corbyn’s “holiday” (though I think you got Whitsun and Easter mixed up). I can understand the argument that we should ignore tittle-tattle but in my opinion we should do our best to respond to lies and smears asap. Under Ali Campbell, I think, Labour had something called the Rapid Rebuttal Unit and I reckon we need another one set up. Echoes of Kerry getting swift-boated*. Team Corbyn needs to respond to attacks instantly and hit back hard. Thanks Pete this is really useful for all members. Many thanks Pete, keep up the good work. Well done Pete, rest assured I have already voted for the left block on the NEC. For anyone who hasn’t seen it, over on Labour Briefing, Darren Williams provides an alternative account of the 12th July meeting (apparently, his first NEC meeting since taking over from Ken Livingstone). As you might expect, there are no substantive differences between the two accounts – coming from the left, PW and DW are in essence honest blokes (as opposed to the despicable, lying, cheating neoliberals from the other side). Instead, there’s a difference evident in the surprise shown by DW at witnessing the actions of the right. For example, on the issue of the rule changes made after JC won the ballot-paper vote, DW provides some insight into the ruthlessness of the right – after a long, gruelling meeting the right remained organised and “seemed to recover more quickly and were determined to achieve some ‘damage limitation’”. Lastly, one brief but significant mention by DW that he overcame the attack on him by the Compliance Unit “thanks to the efforts of [his] solicitor”. As ordinary members, we often lack the resources to employ a solicitor when dealing with Compliance or Regional Office. Maybe this is an area where the increase in the membership can help. There must be lots of legal people among the new membership who would be willing to provide help to members – as ever, it’s just a matter of organising that help. Thanks for the report Peter. Transparency, such as this, can only benefit the party. Thank you for the above cited link to that additional NEC report it answered for me the questions I had been asking about how an apparent ‘success’ for democracy could have been overturned by the ‘top – downers’, which apparently happened because of the ill – discipline and naivety of ‘Left’ members of the NEC. Perhaps it is the exhaustive nature of the continuous challenges from the Right that saps the energy form (us all or) key figure on the Left, but this should have been expected as for them there could be a lot at stake including their privileged positions. I agree with the conclusion Darren Williams Report makes that more organisation is required. I would also add that grassroots Supporters also need to scrutinise and question considerably more. It may be only a matter of personal preference but I would be happier with less energy on the (McDonnell’s, ‘they are incompetent’ type exuberance) on every step forward and more disciplined concern to the next arena of the Right’s fight – in my opinion we have four more years of this (until 2020) and I am still nervous about whether the Right Wing are better at this than the ‘Democrats’. After all they have many more full-timers who have nothing else to do except sit outside TV/Radio studios and talk to Guardian (and even other) Journalists, or act out CryBullying’ scenes against their certain knowledge of intimidation and everyday obscenities in their parliamentary roles. There is one area where I personally think we should be far louder and that is the (likely, or only reasonably conceivably motives behind the NEC Procedural Committee’s combined decisions on voting/speaking rights. There must be 10,000s of Members who are very annoyed about have been required to pay twice (membership +£25) to acquire advertised voting rights. Do they all necessarily know that it was Right Wing anti-democratic manoeuvring that brought it about. Some do of course, but even more widespread understanding of this could be a great reinforcer of change. And now the desperate Right are getting silly with the dirty tricks and the latest silly story on the BBC about going into someone’s office (a month after the Ex-Shadow Minister resigned!). And perhaps another Ex-Shadow Cabinet Minister who after resigning (according to a report in the Obsever) went to his ex-office and wiped the computer clean of Labour’s considered position on the Finance Bill, could name himself so he can face the appropriate disciplinary action. I have said to the Left many times there should be no personal abuse, no threats etc. and we should not dehumanise ourselves but have discipline and take people on politically. In my job at times I work with a Council’s Domestic Violence Team and I would argue that the bullies ganging up on Jeremy Corbyn have been engaging in what it could be argued is tantamount to domestic violence – the mental and verbal abuse of one human being by another/others and don’t forget that whilst tragically 90% of domestic violence is by men on women 10% is also by women on men and all forms of domestic violence are wrong. So although I wonder if the reports may be a little exaggerated one case is one too many so on all sides it should stop now and people should have discipline. By the way I want to tell you a lovely story. A lovely human being and Asian Male Muslim friend of mine told me to tell you that he joined Labour because of Jeremy Corbyn’s humanity and he also said JC has brought millions of pounds into Labour with all of these new members and supporters (possibly up to £15m). Then the white man stood up; so what happened next? The white man apologised and gave him a hug. Blairite Portland Communications drip, drip, drip. Voted for all 6 on Left Bloc for NEC! Just reflecting on Chilcott and just imagine if Blair and Bush were to appear in The Hague. What a signal this would send to the people in the Middle East that we want a new relationship and to treat them as equals and perhaps then Western TNCs could also stop taking their resources. Blair and Bush are repellant human beings but if they did their time it may help them to avoid future poor mental health. I also think Alistair Campbell may have a case to answer too but of course Alistair would say ABC – anyone but Blair and Campbell! I wonder if anyone on here can tell me if there any indications that some of the 172 (or is it up to 174?) are retracting from their initial hotheadness and showing a willingness to returning to working with Jeremy and the Shadow Cabinet? Are there any cracks in the Disloyalty faction? This would be interesting to know, but the current shadow cabinet is a good deal more left wing than the old one. Let’s keep it that way. The context for the coup was the EC referendum result and interesting that in JC’s constituency 76% voted to remain. Could someone kindly do an analysis of the 174 MPs to see the votes in the referendum in their constituencies for remain or leave (which apart from London) could be very interesting. My question was partly answered by Sarah Champion’s return to the fold today. Hurrah for her, let’s have more see sense.